I love this dipping sauce. 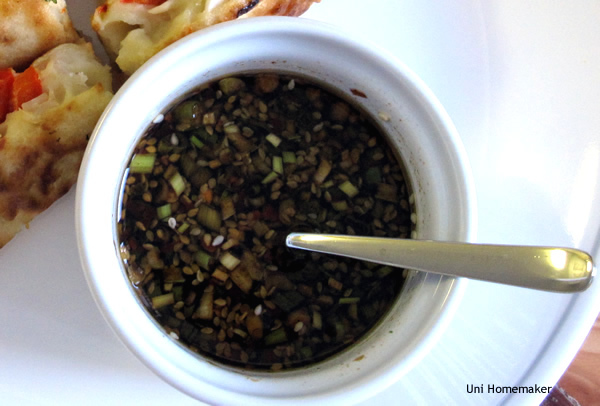 I made it specifically for the Haemul Pajeon dish but you can use this dipping sauce for pot stickers, green onion pancakes, or any dumpling dishes you like. My Mom used to make a similar dipping sauce for dumplings and turnip cakes but she leaves out the red pepper flakes and sesame seeds. She also added brown sugar in hers. In a small bowl mix soy sauce, rice vinegar, sesame oil, red pepper flakes, garlic, scallion and sesame seeds. Stir until combined. Turnip cakes? I’m curious about those!